Just one step in a seven-year process. NB: In this article we will link to PDFs of all of the relevant legal documents we discuss. 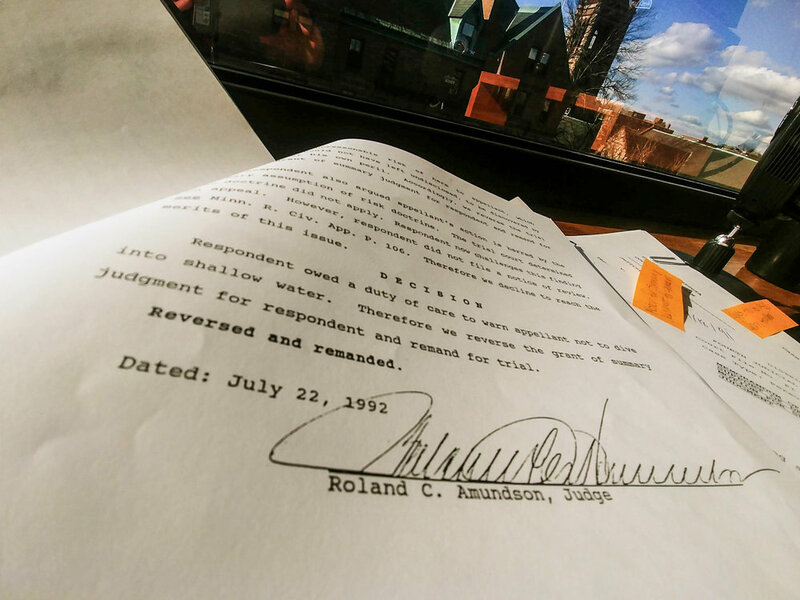 Though these documents are part of the public record, law students rarely encounter documents like them before they become practicing attorneys. In Part I, we asked you, the readers, to serve as the jury for Harper v. Herman. To this point, you have voted largely in favor of boat captain Herman. Those who have commented have expressed sincerity towards Harper, but felt that to some degree what he did was patently risky and that Herman shouldn’t have to pay for those mistakes. It’s a particularly interesting exercise for us because in the real Harper v. Herman case, there was no jury. In fact, in nearly seven years of litigation, nobody--no jury, no judge--assessed the credibility of Theodore Herman. Nobody ever took the measure of Jeffrey Harper. For those of you who aren’t practicing lawyers, that may come as a surprise, but it’s not at all uncommon. 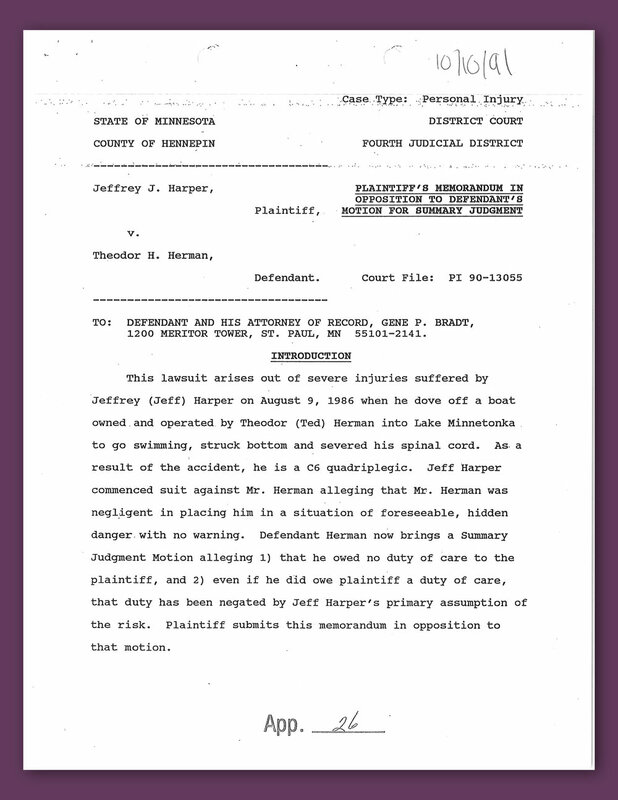 Throughout this Part II of the Harper v. Herman story we’ll give you a blow-by-blow account of the legal battle following Jeff Harper’s fated plunge into Lake Minnetonka. Hopefully it will not only shed light on this particular case but also our civil legal system. The accident from Harper v. Herman occurred on August 9, 1986 but it wasn’t until July 24, 1990 that the case was actually filed. We don’t know why the delay was so long, but the suit was filed well within Minnesota’s six year statute of limitations for such accidents. Harper and Herman’s lawyers spent the next 14 months battling through various pre-trial stages, such as a state-mandated arbitration hearing. But on September 18, 1991, defendant Herman’s lawyers took the fairly major step of filing a motion for summary judgment. At its heart, Harper vs. Herman is a case about negligence. Negligence is perhaps the biggest concept in torts, and to explain it would require something like a semester, so I will try to summarize it in the most succinct possible way. A defendant has acted with negligence if they owed a duty to the plaintiff, they breached that duty, the plaintiff was harmed, and the breach caused that harm. Duty, breach, cause, harm. Four words that will be familiar to any law student. In his summary judgment papers, Herman focused primarily on the issue of duty, specifically that he owed no duty to protect Harper against injuries related to diving off of his boat. He argued that he owed only a ship captain’s duty, which is generally limited to the “safe operation of a vessel.” And even if Herman owed a duty to his passengers to take them to a safe place to swim (given his statements), he did not owe a duty to his passengers regarding diving. Herman also made a defense that Harper had assumed his own risk by engaging in an inherently dangerous activity. This argument in particular seems to have resonated with our readers in our survey last week. Harper countered that focusing only on the safe operation of a boat is too narrow. Herman was not only a boat captain but also a social host (although he did not use that term). Further, Herman owed a heightened duty because, according to his own deposition, he volunteered to take his passengers to a good place to swim and was aware of certain dangers at his chosen location that would be unapparent to a casual observer--specifically that the murky water was extremely shallow. As for assumption of risk, Harper argued that he could not assume a risk because the risk was not apparent due to that same unusually shallow and murky water. “Here, Herman, a social host, informed his guests that he knew of a good swimming area. Such a statement may have created a duty to warn his guests of unobservable swimming hazards. Herman, however, did not inform his guests that he knew of a good place for diving. Hence, he had no duty to warn Plaintiff of any dangerous diving conditions.” Order for Summary Judgment and Memorandum, File No. PI 90-13055, MN 4th Judicial District, Oct. 23, 1991. This is a fascinating argument, and one that is completely absent from the Supreme Court opinion students read today. At its core appears to be a disagreement as to whether the term “swimming” encompasses the activity “diving.” To Harper they are one and the same. To Herman, one is a normal activity and the other is inherently dangerous. What do you think? Does "swimming" imply "diving?" Knowing when to appeal and when to pack up and go home is an extremely important part of an attorney’s job. Appeals cost money and take time. And in a personal injury case like this, that time and money is almost always going to come from the plaintiff’s lawyer because they tend to operate on a contingency fee basis. That is, the plaintiff pays nothing for the lawyer’s time or materials, and in exchange the lawyer claims 1/3rd of any award or settlement. The firm representing Harper only works on a contingency fee basis, so they took a business risk by filing an appeal to State of Minnesota Court of Appeals. The specifics of an a judicial structure vary from jurisdiction to jurisdiction, but the model in Minnesota is fairly representative. There is a trial court level at which witnesses are examined and cross examined, facts are found, etc. This is what you are probably used to seeing on television and in movies. Law and Order, a Civil Action, and of course my favorite, My Cousin Vinny. Trial courts often have juries and opening arguments and closing arguments, although here we skipped all that when the trial judge granted Herman’s motion for summary judgment. Next up is the Court of Appeals, where the parties may go to dispute whether the trial court made a mistake of law, misapplied the law, or made a process error (e.g. improperly allowed something into evidence). There are various other reasons to appeal, including if the finder of fact made an egregious error as to the facts of a case, but they are less common and not applicable here. In Minnesota, as in most jurisdictions, any trial court case can be appealed to the Court of Appeals and the case will be reviewed by a panel of three judges. “Respondent [Herman] owed a duty of care to warn appellant [Harper] not to dive from the boat because he knew the water was dangerously shallow. Respondent voluntarily assumed a duty to exercise reasonable care when he allowed appellant to embark on his boat.” Harper v. Herman, C0-92-196, Minn. Ct. App.(1992). In Minnesota, the ruling issued by the Court of Appeals is almost always final, as only around 100 of the 2000+ cases it decides every year are granted state Supreme Court review. Like its more famous cousin, the United States Supreme Court, appeal to the Supreme Court of Minnesota is not automatic. Appellants who wish further review by the Supreme Court must file a Petition for Review of Decision of Court of Appeals, and only around one in eight petitions are granted. If the Supreme Court had not granted review of Harper v. Herman, we almost certainly would not be talking about it now. Instead, the case would have been remanded to the trial court to go ahead with the trial that Jeff Harper wanted all along. He STILL may have lost based on the facts. For example, we know that in sworn depositions, Harper claimed that the boat was 200 feet from shore while Herman believed the distance was only 30-40 feet. A jury could very well have found in favor of Herman if it believed his rendition of the facts even though Harper had won at the appeals level. “Superior knowledge of a dangerous condition by itself, in the absence of a duty to provide protection, is insufficient to establish liability in negligence. Thus, Herman’s knowledge that the water was ‘dangerously shallow’ without more does not create liability...In this case, Harper was not deprived of opportunities to protect himself, and Herman was not expected to provide protection.” Harper v. Herman, 499 N.W.2d 472 (1993). So for those keeping score at home, Herman won. Almost seven years after the accident, and four years after the case was filed, the parties would no longer be in litigation. Harper would collect nothing from Herman despite his severe injuries. Herman, for his troubles, undoubtedly paid a significant amount of money to his attorneys to defend him over all the years of litigation. By the nature of the activity, defense attorneys do not operate on a contingency fee basis. We don’t really know what happened to Jeff Harper and Theodore Herman. Today, Harper would be a 50-something quadriplegic person, while Herman would be in his 90s. It’s been over 30 years since both of their lives were turned upside-down by the activities on a 26 foot Thunderbird Motorboat. But as evident from our summary above, their story did not end when Jeff Harper hit the lakebed. Instead, Harper and Herman were tied together in the aftermath through years of litigation. And because their dispute was reviewed by the Minnesota Supreme Court, in a way they are tied together forever. When we read cases in law school, we rarely think about all that came before the decision we read. Students don’t know about arguments that won and lost at the stages below. For example, the Minnesota State Supreme Court never mentioned the distinction between swimming and diving in its opinion, even though that was the basis for Herman’s initial win. Students aren’t given the opportunity to consider why a losing party appealed, or even how the litigation itself impacted the parties or their attorneys. In researching this article, we reached out to the attorney for Jeffrey Harper, who is still in practice (Herman’s attorney has since retired). She did not respond to our inquiry. Given the battle she fought on behalf of her client and lost, one can only wonder how much that loss hurts to this day. Behind each case there is a story. There are winners and losers, but nearly everybody is impacted in some crucial and important way.